(Photo: REUTERS / Rebecca Cook)Michigan Stadium is seen before the start of the NCAA college football game between University of Michigan and Notre Dame in Ann Arbor, Michigan September 10, 2011. 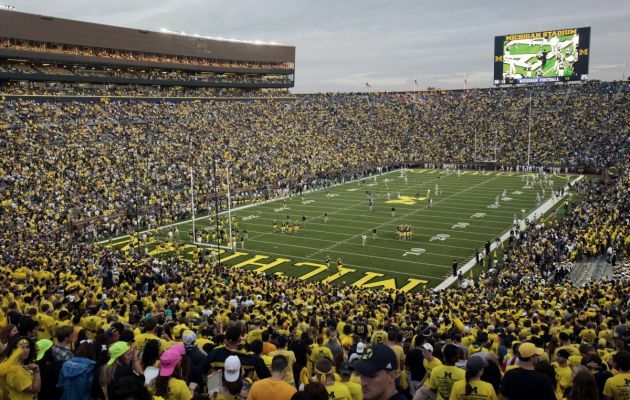 Both teams wore throw back jerseys during the first night game in the history of Michigan Stadium. From near and afar Notre Dame University is famed for its faith and its football. The two icons that characterise the world famous Catholic institution are the golden dome of its Sacred Heart Basilica and its football posts. Notre Dame was in Europe during the week to inaugurate its new Rome Center, because the university is also a valued academic institution. The Rome facility one block from the Coliseum offers programs in architecture, arts and letters, linking with the university's presence in London and Dublin. The Pope met a Notre Dame delegation on Thursday and offered them some advice, or a dressing down, depending on the interpretation of his words. University officials said the meeting with Francis was very cordial. (Photo: Courtesy of Vatican Photo Office. )University of Notre Dame president Rev. 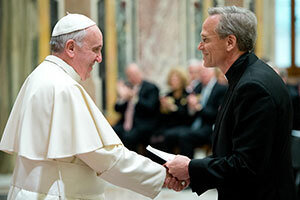 John I. Jenkins, shakes hands with Pope Francis at the Vatican on January 30, 2014. Photo courtesy of Vatican Photo Office. "It is my hope that the University of Notre Dame will continue to offer unambiguous testimony to this aspect of its foundational Catholic identity, especially in the face of efforts, from whatever quarter, to dilute that indispensable witness," Pope Francis said when he met the delegation. In the delegation were 140 trustees and administrators from the University of Notre Dame, including its president Father John Jenkins. Following the meeting, the U.S. Conference of Catholic Bishops (USCCB) on Friday called for a day of prayer and fasting for Catholic education. In his address to the Notre Dame delegation the Pope said, "From its founding, Notre Dame University has made an outstanding contribution to the Church in your country through its commitment to the religious education of the young and to serious scholarship inspired by confidence in the harmony of faith and reason in the pursuit of truth and virtue. "Conscious of the critical importance of this apostolate for the new evangelization, I express my gratitude for the commitment which Notre Dame University has shown over the years to supporting and strengthening Catholic elementary and secondary school education throughout the United States." In 2009, the university was criticised by some Catholics for inviting U.S. President Barack Obama to speak at the school's commencement and awarding him an honorary degree, despite his vocal support for legal abortion. Catholic News Agency reported that the university also drew criticism for its announcement in January that it will comply with provisions of the U.S. federal contraception mandate. This will result in free contraception, sterilization and early abortion drugs being given to those under university health insurance policies. Notre Dame has filed a lawsuit over the mandate and had unsuccessfully sought a court order to block the mandate's enforcement while its case worked its way through the court system. The lawsuit will continue, but the university is cooperating with the mandate pending a ruling. Failure to comply could have resulted in massive fines. Patrick J. Reilly, president of the U.S.-based Cardinal Newman Society, which monitors and supports faithful identity in Catholic education, told CNA that Pope Francis seemed to be calling Notre Dame to a path of fidelity, which begins with an institutional commitment to the faith and the Church's vision for Catholic universities. The news agency quoted Reilly as saying that the school had experienced problems with Catholic identity in the past, but he noted "there is a faithful cohort of students and faculty present on campus." Michael Sean Winters blogged in the National Catholic Reporter that conservative Catholics were saying that the Pope gave the university delegation a dressing down which he refuted. "So, no, the Pope did not spike any football Thursday. He did not trash talk the University of Notre Dame. He encouraged the school to keep doing what it is doing."